The Centers for Medicare and Medicaid Services, has awarded a 5-Star Rating to The Villa at Great Lakes Crossing, a Villa Healthcare nursing facility located at 22811 W. Seven Mile Road in Detroit. This prestigious designation is awarded to only the finest facilities demonstration extraordinary clinical and regulatory excellence. Fewer than 10% of all facilities nationwide achieve this honor; The Villa at Great Lakes Crossing is one of few skilled nursing facilities with this prestigious status in the area. “Results like these would not be achieved without the hard work and dedication of the staff at The Villa at Great Lakes Crossing. It is because of them that we received this exceptional rating!” commented Mark Berger, CEO at Villa Healthcare. The 5-Star Rating for The Villa at Great Lakes Crossing reflects Villas Values. Our clinical staff and our concierge teams ensure that a guest’s stay is an overwhelmingly positive experience that enables each individual to recover in beautiful surroundings, while introducing services and amenities of a fine hotel. Our goal has always been to return our guests back to the community with an improved level of functioning in the most expeditious way possible. The Villa at Great Lakes Crossing joins other Michigan Villa Healthcare facilities, Villa at the Bay and Villa at West Branch, with this prestigious honor. Now that it has maintained this top-tier status, The Villa at Great Lakes Crossing intends to keep striving. “We know we must continue to earn trust and we appreciate the continued support of the community,” reflected Berger. 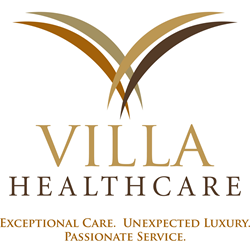 Formed in 2010, Villa Healthcare began operation by assuming control of several underperforming or marginal skilled nursing facilities. Drawing on decades of experience in nursing facility ownership and management, the Villa Healthcare team began with a clear set of core beliefs and a visionary business and financial model honed over many years of successful operation. At present, Villa Healthcare consists of 23 facilities throughout the Midwest, including their latest acquisition of the Bortz Healthcare facilities throughout Michigan. The organization has gained a reputation for its medical expertise, compassionate and attentive patient care, and innovative treatment and programs. Our community involvement and support are cornerstones of Villa Healthcare’s operating philosophy. The Center for Medicare and Medicaid Services is a division of the Department of Health and Human Services. One of its charges is to monitor and rate nursing facilities nationwide. CMS created the Five-Star Quality Rating System to help consumers, their families, and caregivers compare nursing homes more easily and to help identify areas about which you may want to ask questions. The Nursing Home Compare website features a quality rating system that gives each nursing home a rating of between 1 and 5 stars. Nursing homes with 5 stars are considered to have top-tier quality, and nursing homes with 1 star are considered to have quality much below average. There is one overall 5-Star rating for each nursing home.